If your relationship is breaking down, it’s often hard to find the time to sit down and really assess what impact separate or divorce might have on you, your family and your lifestyle. You may also want to seek out legal advice without family of friends knowing, or not disclose your concerns to your spouse for the present time. At LGFL, we’ve always offered free 30-minute legal advice sessions at our main offices here at Wyvols Court in Swallowfield. However, we appreciate that their discreet countryside location isn’t always convenient for those with busy lives, or who don’t drive to work. Some clients have also told us that meeting us at our main family lawyers office can feel a little too formal at a stage when they are “information gathering” or considering their next move. That’s why we decided to come to you - as far as is possible! We now have sessions available at Spaces Reading, a smart new meeting venue in central Reading just five minutes walk from the station. We’ll meet to discuss your situation and options over a cup of coffee in this light, airy and busy setting. There are people constantly coming and going at Spaces Reading, attending meetings or coming in to work in shared spaces. This activity offers you a high level of anonymity as nobody will know whom you have come to meet, or why. Spaces Reading offers you the chance to quite literally sit down on a sofa and talk – no big desks, no phones, and no interruptions. So, you can relax and discuss what you want during your free 30-minute session. 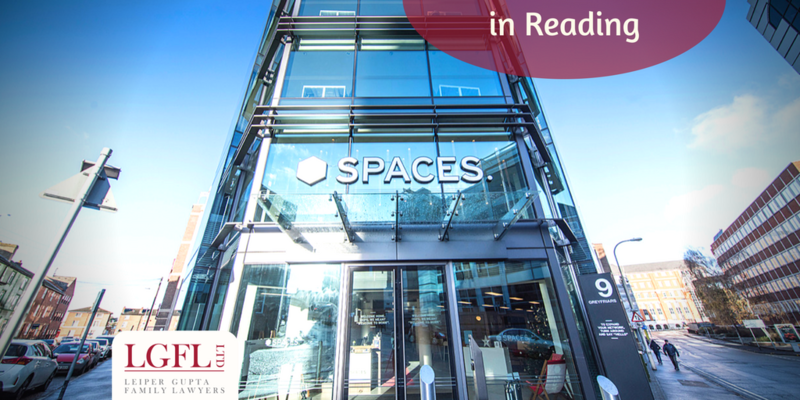 Spaces Reading is used extensively by the business community, so if you work in central Reading, you can walk from your workplace, meet with us, and be back at your desk within the hour. Equally, since Spaces is so close to Reading station in Greyfriars Road, you can arrange to meet us on your way in your way home from work. If you’d like to talk for longer, just let us know when you book your session, and any additional time will be charged at our fixed hourly rate, plus VAT. Again, you can pop out of the office, meet with us, discuss your situation, get the information and advice you need to move forward, and be back at work before your colleagues have finished their sandwiches. If you’d like to book a longer session, please let us know when booking, and you will be charged for any additional time at our fixed hourly rate, plus VAT. If you decide you want to appoint us to help you, that’s fine - we can sort out the details at our next meeting in our offices. However, you are under no obligation to do so. This first free session is as much about us meeting you and you meeting us, so you’re happy we’re the right legal team for you moving forward. The majority of people we meet do go to instruct us for their legal matter, and some come back for help on various matters at a later date. Either way, we’ve met you and discussed your concerns, and that’s always time well spent. By law, we do require proof of ID before we can begin your session. You can send us a scan by email in advance, or come to the meeting with a copy. Either way, we will require sight of the original documents at our meeting. For more details, see our 30 minute consultation page, where you’ll also find our free legal consultation session T&Cs.